Dr Julianne Nyhan is lecturer (assistant Professor) in Digital Information Studies in the Department of Information Studies, University College London. Her research interests include the history of computing in the Humanities and most aspects of digital humanities with special emphasis on meta-markup languages and digital lexicography. She has published widely, most recently she co-edited Digital Humanities in Practice (Facet 2012) and the bestselling Digital Humanities: a Reader (Ashgate 2013). She is at work on a book about the history of Digital Humanities (it will be published by Springer later this year). Among other things, she is a member of the Arts and Humanities Research Council (AHRC) Peer Review College, the communications Editor of Interdisciplinary Science Reviews and a member of various other editorial and advisory boards. 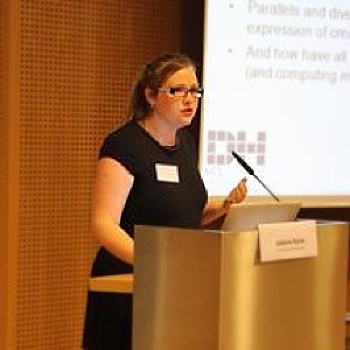 She also leads the ‘Hidden Histories: Computing and the Humanities c.1949–1980’ project (https://hiddenhistories.omeka.net/). She tweets @juliannenyhan and blogs at http://archelogos.hypotheses.org/. Further information is available here: https://www.ucl.ac.uk/dis/people/juliannenyhan.